After Effects CC2018 introduced a really neat script which allows you to create nulls based on the position of points on a path, that you can then use to control the path’s shape. 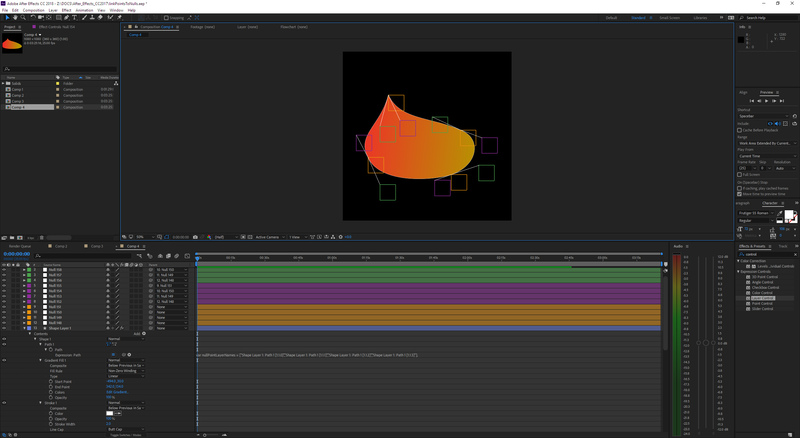 While this is really useful (and hasn’t been an integral part of AE before, although there have been workarounds with plugins like BAO Mask Avenger), it doesn’t create nulls for path tangents – which means that for curved paths, you’re stuck with whatever curvature you started with whenever you move a point. So, we’ve added extra functionality to this After Effects script so it now creates a null for each tangent (in and out) as well as the points on the path, too. Tangent nulls are parented to their path nulls, so when you move a path point, the two tangents also move. This does mean a lot of nulls, but hey, you pays your money, you takes your choice. And here’s the full script. Attach nulls to shape and mask vertices, and vice-versa.